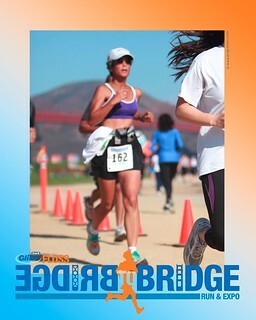 This Sunday I competed for the third time in the Bridge to Bridge race. I've always enjoyed this course, which is very familiar, starting at the Ferry Building, going through Aquatic Park, up to Fort Mason, then out along the Marina and on to Crissy Field. Normally it's a 7K/12K and I've always opted for the shorter distance, but this year the longer course was altered to a 10K due to road construction, so I ran that route. I had a breakfast of oatmeal and tea two hours before the run since that worked well in my last race, then walked the 25 minutes or so to the race start, checking in my jacket at the sweats truck. The pace markers at the beginning were appreciated, though I wish they'd had something in between "9 min/mile" and "walkers/baby strollers". The weather started out cool but quickly warmed up. I ran the first couple of miles at about 10 minute pace, but knew I couldn't maintain it, especially with the hill at mile 3. By then I'd ditched my shirt, and by mile four was pouring water over my head to stay cool. I had a couple of close calls with pedestrians crossing the course early in the race, but no problems with fellow runners. By the time we turned around at Fort Point with less than a mile to go, I was really getting tired, and wished I hadn't gone out so fast. Still managed a final burst of speed at the finish line, which I crossed in 1:03:50, for an overall pace of 10:17/mile. I am counting this as my new 10K PR, given the questionable course distance and timing from the Big Gay 10K earlier that month. I placed 55% in the overall field, 42% for female, 39% for female 40-49. My age-graded score was 50%. (Results page here.) I feel good about finally being a mid-pack runner rather than a back-of-the-pack runner. I may never win an age-group award (although I won several with LMJS, I was the only one under 30 in most of those races so that hardly counts), but I can still improve my performance significantly.